﻿ Cristiano Ronaldo: "We want to win against Denmark and assure we'll be in the EURO 2012"
09.10.2011 » Ronaldo: "We want to win and assure we'll be in the EURO 2012"
Cristiano Ronaldo has been assuming his leadership role in the Portuguese National Team and wanted to send a strong and positive message to the fans, before the decisive match against Denmark. 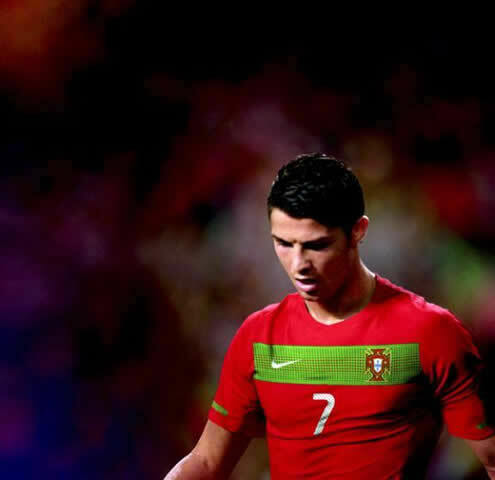 Ronaldo is confident that Portugal will book their place in the EURO 2012, after defeating the Danish side this Tuesday. Portugal will take on Denmark this Tuesday, in a game where the Portuguese side only needs a draw to assure they won't be missing the EURO 2012, next Summer. Event though a single point is enough, Cristiano Ronaldo wanted to pass a message of confidence and said that the "Lusitanos" are prepared to fight for the win, because that's what they do every match. Cristiano Ronaldo: "Portugal will travel to Denmark to win that match. That's what we have in mind. We have enough capabilities to go there and come out with the 3 points. We are aware that 1 point is enough to be in the EURO 2012, but we want to win. That's the mentality we have in the "Selecção" (National Team)." stated the Portuguese captain, who is expected to be in the line-up in this decisive game against Denmark, despite showing a few fatigues signs in such early stages of the season. In this match preview press-conference, CR7 was also asked to comment on the errors and lack of confidence that the Portuguese defensive players have shown in the match against Iceland, where they conceded 3 goals. Cristiano Ronaldo: "Sometimes, when we can't manage to deliver it on the attack, it's our defense that save us. Pepe is surely missed, but we have to count with those we are with us now. We could refer to Pepe, as we could to Ricardo Carvalho, who's not coming back anymore." Cristiano Ronaldo didn't score any goal against Iceland, but once again, CR7 outlined that his priority will always be to help the team winning matches and get qualified for the EURO 2012. Ronaldo: "I'm not worried about scoring goals. The important thing is to win and to make sure we'll get qualified for the EURO 2012." As you probably already know, next year's EURO 2012 will held in Poland and Ukraine, during the Summer. The journalists then insisted on a topic that has already been approached several times over the last weeks and months, How does Cristiano Ronaldo feel about the way he keeps being received and weldomed in the stadiums. Ronaldo noted that he's not worried about that: "I don't care if I'll be booed and whistled in Copenhagen against Denmark. Those situations in Cyprus where some people shouted and chanted for "Messi" were started by a few morons that were on the stadium, but I don't think they speak up for most of the crowd. Those who really enjoy watching football, will surely appreciate seeing me on the pitch." 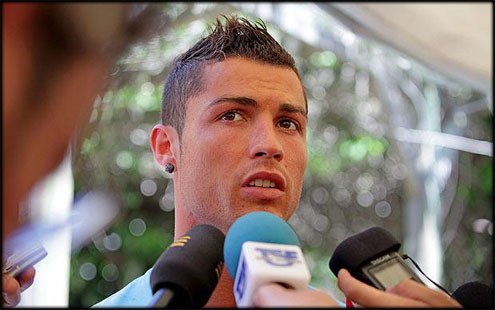 Before ending, Cristiano Ronaldo self-assessed his own physical condition. Ronaldo: "I've been training with limitations, but those who know me, are aware that I don't like to stop and I'll be at 100% in a few days from now." said Real Madrid star, before concluding his comments, by analysing his Manchester United teammate form, both in the club and the National Team: "It's a good thing that Nani is on the peak of his form, because that will reveal itself as very important for the Portuguese National Team." Cristiano Ronaldo is now preparing the important match against Denmark, scheduled for this Tuesday (11-10-2011). You can watch Denmark vs Portugal free, in our Football Live Streams section. The countdown clock timer, displaying the time left for the next Ronaldo game, is shown on the top right corner of all pages. This Tuesday, you'll can also watch Spain vs Scotland live. Next Saturday, the Premier League returns and you can follow the big rivalry clash between Liverpool vs Manchester United online. All streamings are provided from our "Live" section.